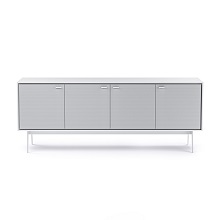 The Elements Quad Cabinet, designed by Al Glass and Jason Guidry for BDI, is an eye-catching, versatile storage console that combines form and function with ease. The door panels of the cabinet, which are backed with perforated metal to conceal its contents, are crafted using laser-cutting technology to create a precise, architectural effect. 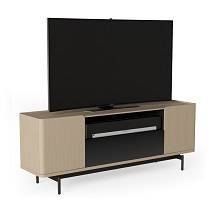 The cabinet is four compartments wide, with a center compartment containing a storage shelf that accommodates most soundbar speakers. Shown in a natural walnut finish with tempo patterned doors and a console base.